During June the ferry service described below only runs in the morning. Stayed the night before in a "tent cabin" at a nearby whitewater rafting company Northern Outdoors http://www.northernoutdoors.com/ campground. The next morning met Master Guide Dave Corrigan on the north side of the river. Due to recent rain the water was almost too high for him to cross by canoe! There is a "white blaze", the official mark for the AT, on the floor of his canoe. A bridge has not been built here because huge blocks of ice come down the river every Spring and would destroy all but the largest bridge. So, across we go with another hiker (trail name - Sisyphus) and his dog (a 10 month old Husky named Icarus) in the middle. We ferried across, pointing the canoe at an angle pointing upstream and toward the far side. After crossing, we were far downstream from our starting point, but right on target. The Kennebec River is the most formidable un-bridged crossing along the entire 2,174-mile Appalachian Trail. The Kennebec is approximately 70 yards wide with a swift, powerful current under the best of circumstances. However, as a result of releases of water from hydro facilities upstream, the depth and current of the river surge quickly and unpredictably. You cannot cross faster than the water level rises. DO NOT ATTEMPT TO FORD THE RIVER.PLEASE USE THE FERRY SERVICE. The MATC and the Appalachian Trail Conference have contracted with David P. Corrigan of Fletcher Mountain Outfitters for the next three years to provide a scheduled ferry service across the Kennebec River at the A.T. crossing at no cost to hikers. This ferry service -- not fording -- is the officially sanctioned means of crossing the Kennebec River on the Appalachian Trail. The A.T. was located here originally because of the existence of a ferry to provide access to Pierce Pond for visiting sportsmen. 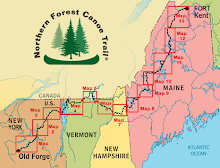 Hikers must meet the ferry on either the east or west banks of the Kennebec River at the point of the AT crossing. If the ferry is on the opposite side, a signal flag will be provided to alert the ferry operator. Hikers will be required to sign a release form, wear a life jacket, and follow the instructions of the ferry operator. If river conditions or weather make the crossing dangerous in the judgment of the ferry operator, the service will be discontinued until conditions improve.